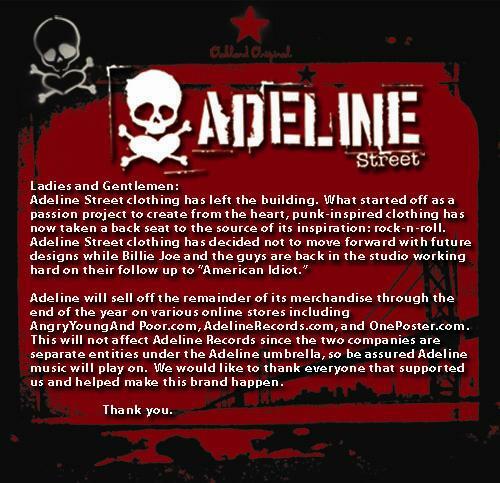 Adeline Street, which was the clothing line and merchandise portion of Billie Joe's label (Adeline Records) has decided to shut down. They posted this message on their MySpace which read in part "Adeline Street has decided not to move forward with future designs while Billie Joe and the guys are working hard on their follow up to 'American Idiot'". They also noted that the record label was going no where as the two parts are separate entities, and that Adeline Records would continue with their music. They are selling out all of their merchandise which can be bought at the Adeline Records store, AngryYoungandPoor.com, and OnePoster.com. Also Steady Clothing (who worked with Adeline Street) will be having it's annual Holiday sale where they open up their warehouse in Santa Ana, California and they'll have the last of the Adeline Street merchandise including discontinued merch and items from their sample line. So if you're in that area and want some of this stuff find the info on this flier.